The landmark 175th Tomintoul and Strathavon Highland Games retained its famed spirit despite being hit with wind and rain. Crowds flocked to the arenas at the park in the Moray village to soak up the atmosphere of the annual gathering. To mark the special occasion a 16-year-old whisky from Tomintoul Distillery was put on sale, with only 102 bottles available. Malt enthusiasts snapped up the rare dram with more half the bottles being sold on the day. The 2,500-strong crowd enjoyed the familiar sight of athletes in the heavy competition throwing the hammer and tossing the caber – with a new record being set in the 28lb weight for distance category by Kyle Randalls, who managed 78ft in the junior event. 117 Erin Forbes from Buckie dances with her partner. Kyle Randalls with the Caber. Games secretary, Patricia Grant, said: “We held our first ever drumming competition. A bumper entry for the annual tug of war tussle – won by Elgin A – also pleased organisers after several fallow years. Pipe bands added music to the occasion as visitors to the area enjoyed the afternoon’s competitions between looking at the stalls. Tomintoul’s traditional pillow fight drew laughter from the crowd as the rivals battered each other with sacks. Other light-hearted events included the barrel rolling contest and the “tilt the bucket” challenge, where contestants had to avoid getting soaked while pushing a wheelbarrow with a bucket of water on it. Supporters among the crowd cheered on their friends and family as they fought for local pride in the village. 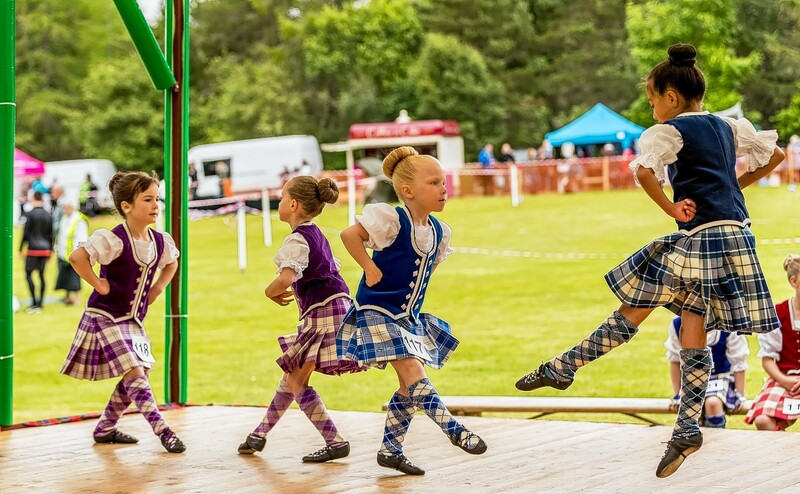 Highland dancers showed off their talents in their customary colourful style on the wooden stage. Dancing secretary, Alison Milne, said the level of competition was as high as ever, despite the conditions. She said: “There was an excellent turnout and they were all to a very high standard.